This article is reprinted from the April, 1998 edition of Your Jerusalem. “With the sound of this coin dropping, the exile officially ends,” declares Reuven Prager dramatically, as he holds one of the newly minted Half Shekel coins just above the gilded chest he built to hold them. “With the loss of sovereignty over the land in 70 CE, we lost the ability to safeguard hekdesh (property sanctified to the Holy Temple). We now have the ability to safeguard hekdesh, albeit not the will,” says Prager. The occasion is Purim night, the traditional time for the giving of the biblical Half Shekel. 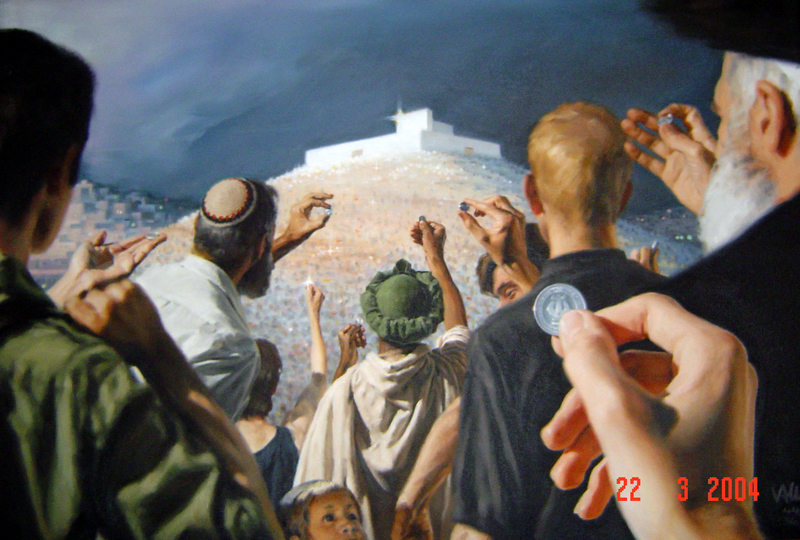 The place is the auditorium of the Bible Lands Museum, temporary home for the gilded chest into which Prager and a sizable crowd are about to place their silver Half Shekel coins. The excitement in the air is palpable as Prager waves his coin in the air, explaining the significance of the act he is about to perform. Finally, after much buildup and explanation, he drops the coin, thus bringing back hekdesh for the first time in nearly two thousand years to the Jewish people. Pitted against monumental apathy and what Prager says is a “galut (exile) mentality which opposes any changes in the status quo, even when those changes are a return to a more authentic form of Judaism,” Prager laments, “We’ve had a lobotomy, or a stroke, or we’re just plain brain dead.” It is against this apathy and clinging to galut ways that Prager is fighting. Born out of his own personal struggle with God, his fight led him to start Beged Ivri, an organization which helps restore ancient Israelite customs. “We’ve had a lobotomy, or a stroke, or we’re just plain brain dead.” It is against this apathy and clinging to galut ways that Prager is fighting. For the past fifteen years Prager has been researching and restoring such customs as biblical clothing, techelet (the thread of blue worn on the fringes of four cornered garments), ketoret (the incense used in the Temple service), and biblical weddings. The restoration of the Half Shekel coin is the latest of his projects, an endeavor in which he has invested thousands of hours to date. The yearly giving of the Half Shekel coin stems from the biblical commandment in Exodus 30:11-16, for every man between the age of 20 and above, which is the age range for military service. 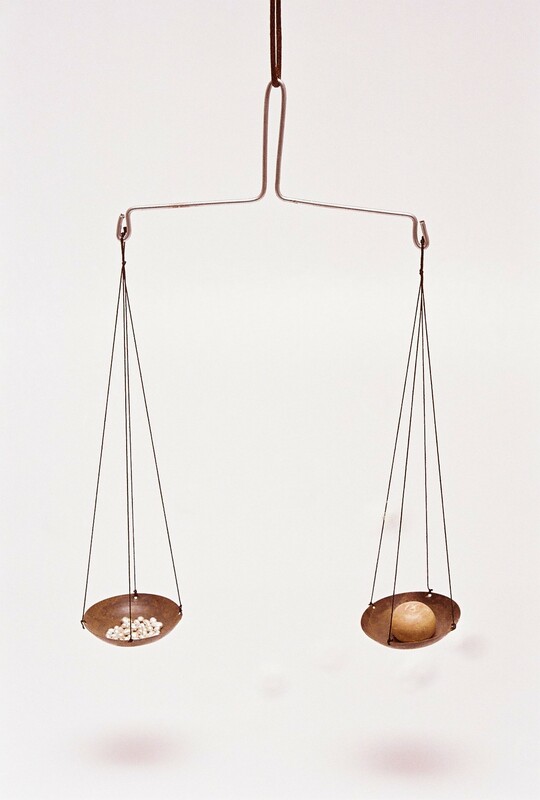 The Bible refers to the Half Shekel as an atonement for one’s soul and the Rabbinical sages bring down that the giving of the coin serves as an atonement for the potential taking of life, for which every soldier is liable. During the entire period of the Tabernacle and First Temple, and 100 years in to the period of the Second Temple, we fulfilled the commandment of giving the Holy Half Shekel by weighing silver nugget against stone weights. The new year for giving the Half Shekel is the 15th of Adar. In the ancient days every congregation set out a shofar-shaped collection box in which the congregants gave their Half Shekels, starting on the 15th of Adar and continuing throughout the year. The coins from these shofars were then transferred to Jerusalem. Although the coins became sanctified upon being deposited in the shofar, it is from the moment of the Trumat ha-Lishkah (Separation of the Office) ceremony that the coins became the property of hekdesh (the Temple). The Trumat ha-Lishkah ceremony is an ancient ceremony in which nine Kohanim, each wearing skin-tight outfits in which a coin could not be hidden, would enter into the lishkah, a special room where the hekdesh was stored, and remove nine baskets of coins. The nine baskets were used to pay for the daily communal sacrifices, the spices of the ketoret (Temple Incense), the flour for the minhah (meal offerings), wine for the libations, etc. The remainder of the coins, known as she’arit ha-lishkah, went to pay for preparing Jerusalem for the three pilgrimage holidays and other important activities. A separate fund from the collection of old Half Shekels, donated by those who missed previous years’ payments, was used for building up and maintaining the walls the of Jerusalem. The ceremony was performed three times a year, as coins from communities in distant lands continued to arrive. Until March 26, 1998, this ceremony was of historical relevance only, having ceased with the destruction of the second Temple. On March 26, 1998, for the first time in 1,928 years, the ceremony of the Separation of the Office was performed in Jerusalem. Held at Harrari Harps, the ceremony consisted of public reading of sections of the Mishnah Tractate Shekalim relating to the Trumat ha-Lishkah ceremony, followed by the actual separation of the coins, making them “absolute hekdesh”. The coins were then transported by Brink’s armed guards to the offices of the Chief Rabbinate, where they were sealed in a safe and the keys given to Chief Rabbis Lau and Bakshi-Doron. The emotional presentation was accompanied by shofar blasts and much excitement from the onlooking crowd. 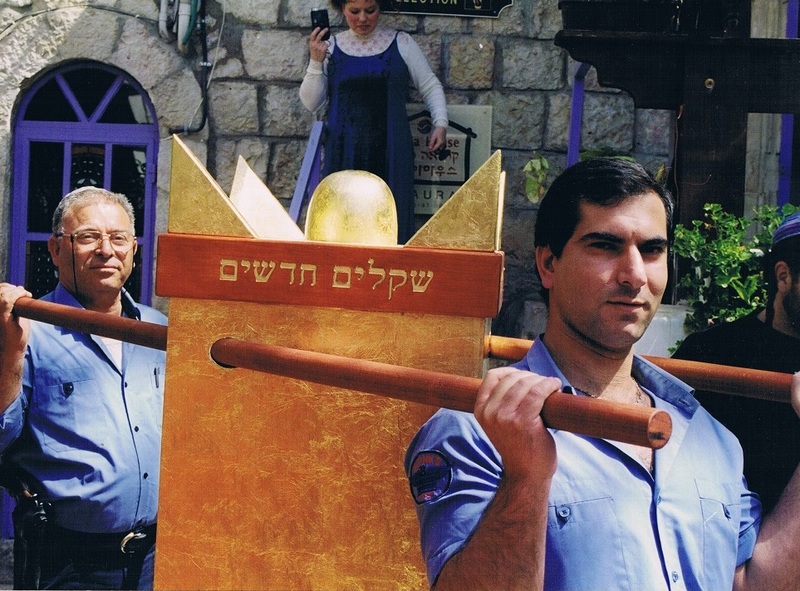 Brink’s guards, who are also Kohanim, carry the Holy Half Shekels to the office of the Chief Rabbinate of Israel after the Separation of the Office Ceremony. The creation of sanctified property can be considered an issue that today’s leaders of the Jewish world will have to begin grappling with. Even those who oppose the creation of hekdesh, on the grounds that it could come to misappropriation, admit that the donated .999 fine silver coins, each weighing just over 10 geras, or 7. 8 grams, are unquestionably valid hekdesh. Leading rabbinical authorities have been consulted in each step along the way. “He recommended that I take the coin to HaRav Shlomo Min HaHar, the posek ha’dor (ruling authority) on anything related to zecher le-churban (things done in memory of the destruction of the Temple) for his opinion, and to HaRav Yoel Schwartz, an expert on brachot (blessings). “On Sunday, June 15th, together with two witnesses, I brought the specimen coin to the Jerusalem home of HaRav Shlomo Min HaHar. From the moment we put the coin in the Rav’s hand he started laughing, and continued to laugh until we had left his home. His parting words to us as we stood at the door were ‘pa’amei ha-geulah’, the footsteps of the redemption. As we left, I turned to my friends and quoted, ‘then our mouths will be filled with laughter,’ from Psalm 137. The Rav asked for two days to check all aspects of the coin, and on Tuesday, June 17th, he gave us his approval. “On Friday, June 20th, I met with HaRav Yoel Schwartz in his home in Mea Shearim. He confirmed our findings regarding the absence of a clear tradition regarding a bracha (blessing) for the giving of the Holy Half Shekel. However, after extensive digging, we discovered a text written by Rabbi Yehudah ben Yakar (12th century) which not only teaches that we do make a blessing, but even brings down its text. “I responded that this was true during the exile, when we had no way to safeguard the sanctity of the donated coins, being subject to the whims of the gentile host nations amongst whom we dwelt. ‘However, today we can safeguard the sanctity of the coins, and it would only be because of the laziness of today’s Rabbinate that any misappropriation would occur. Since when do we forgo the observance of a Torah commandment because our religious leaders are too lazy to be bothered? Give me a precedent where we canceled observance of a Torah commandment because of laziness?’ To this he had no response, as indeed there is none. With the restoration of the biblical Half Shekel coin, the indomitable Reuven Prager once again has brought ancient history into modern reality, and by doing so has challenged us all to rethink our modes of Judaism. 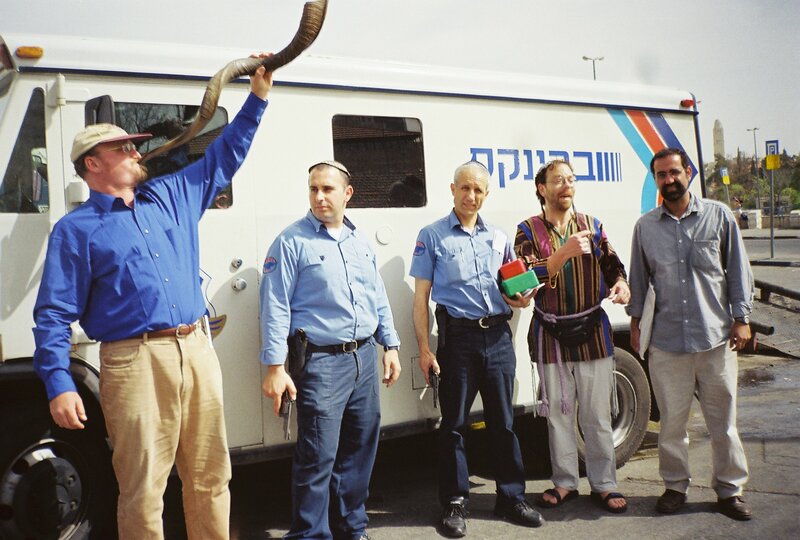 Celebratory blowing of the shofar after completion of the Trumat ha-Lishkah (Separation of the Office) ceremony. Log in | Register |	89 queries. 0.607 seconds.